Thanks to everyone who downloaded the free winter maintenance report at the start of the winter. Now here we are approaching the Christmas holidays and I don’t think many of you will have been able to implement much of the work that I recommend both in the Winter Maintenance Guide and in Performance Bowling Greens, a practical guide. This is of course due to it being too wintry! Well the good news is that if you made even a start to the recommended autumn/ winter compaction relief work by getting one or maybe two passes made with the deep slit tiner, then the frost will be doing a lot of good by getting into the soil and heaving it into fissures in the compacted zone. it is going to prove difficult to do any work on greens throughout most of the UK this winter due to excessive frost and snow cover on greens; The winter program is essential and if your particular corner of the nation is free of frost and snow you should bash on with the winter work as much as you possibly can. The worst effect of this excessive cold weather is that the soil temperature is being forced down to levels that we don’t usually have to put up with very often. This second point is very important and will become increasingly so in the months and years to come. Well, my old Mum has a saying: “We’ve never died a winter yet”, which of course means that we are resilient and can adapt our approach to life to cope with whatever it throws at us. Is it time to apply this thinking to our bowling greens; do they need further protection from the winter than we currently afford them? Although I am not advocating a panic buying type situation I do think it is time for us to look at the facts of climate change and the possibility that there might be years in the future when we need to be prepared to implement a different approach to winter green protection than we ever have before. I am of course based in Scotland, and you should factor that in when applying the remainder of this article to your situation. This is the second “real” winter we have experienced in a row and it looks like there will be records broken again this year. The extreme cold we experienced from early December 2009 until March 2010 caused a complete depletion of the soil temperature. This was combined with a very dry spring and the knock on effect of this was that we effectively had a 3 month bowling season here; with no significant growth until early June; and we were quite noticeably heading into autumn again by late August. Now we are experiencing the earliest onset of sub-zero temperatures for a long time; here in upland Perthshire we had almost 3 feet of snow cover during November and after a slight thaw we are now back to -100C at night. Now of course this might turn out to be a blip and we might not experience another spell like this for a decade. However, it can’t have escaped your attention that we do seem to be subject to increasingly extreme weather; from the tropical style rainfall in summer to these extremes of cold in winter. The frequency of these events is quite obviously increasing and regardless of the cause, these are attributable to a noticeable change in our climate. As mentioned earlier, the effect of the extremely cold winter and cold and dry spring was a complete failure of greens to get growing in the early part of 2010. This is a major problem if the season only lasts 6 months at best so what can be done? 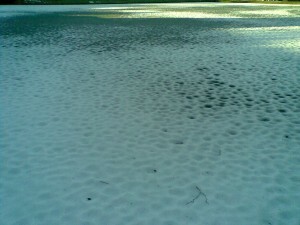 Is it time to adopt a different approach to winter green protection?. The key problem is that during prolonged periods of excessively cold weather, the soil temperature becomes negative and early spring growth requires temperatures in excess of 50C to get started in earnest. Now to give you an example of how long it can take for that to happen we can have a look at a system that’s been used by farmers for decades to decide when 50C has been achieved. The farmers use a tool called the T200; and simply put this means that the soil temperature is noted every day from January 1st and each subsequent day’s top temperature is added to the one from the day before. Negative values are ignored and when the figure reaches 200, you can be pretty sure that the soil is up to about 50C. This means that we need at least 40 days of at least 5 degrees air temperature to achieve T200. Just about every day in January and February 2010 was at or below zero, meaning that the whole of March and half of April was needed to achieve T200. Now this only suggests that the minimum soil temperature for start of growth (50C) has been reached, so you can see how big an effect this can have. Now the T200 measurement is a rough rule and not a scientific measurement by any means and is based on averages over many years. However, if we are starting at a soil temperature of below zero and that has been set in for a month or more as it was in winter 2009/10 then the soil warm up will take much longer. At this stage it should be emphasised that we shouldn’t panic; the current pattern of weather might be a blip or part of a cycle of some sort and it would be easy to over engineer a solution when a simple strategy might be more useful. However, even one year like this can be unacceptably disruptive to already struggling clubs so we need to look at potential contingencies and prepare to use them if required. Well we could look at the effects that severe winter conditions have on fine turf elsewhere and where better than Canada? The golf industry is of course big business in Canada as it is elsewhere and as a result there has been a considerable amount of research in to winter kill of fine turf and subsequently the protection of fine turf from winter kill. For the purposes of looking at the potential dangers to bowling greens from winter kill; golf green research is a pretty close match. Freezing temperatures: reducing the soil temperature and more critically the plant crown area temperature. The crown of the grass plant is the node just above ground level from which new shoots emerge. Damage to the crown area will invariably lead to death of the plant. Incidentally this is why very close mowing is damaging to overall turf density. Desiccation injury: this is where the plant loses a critical amount of moisture in a process akin to freeze drying; the result is the same as before, i.e. the plant dies. During this research a selection of green covering methods were tested with varying results. These ranged from proprietary mats and sheets to good old straw. Most of the covering methods were very good at maintaining an acceptable surface temperature for the protection of the grass plant crowns and a soil temperature of around 50C, despite air temperatures of -200C and even -300C. Regardless of the cover used, the one factor that improved the soil surface and rootzone temperature retention was of course snow cover; as we know from looking at winter disease problems in the past, snow forms a very effective insulation and helps to retain some heat in the soil. 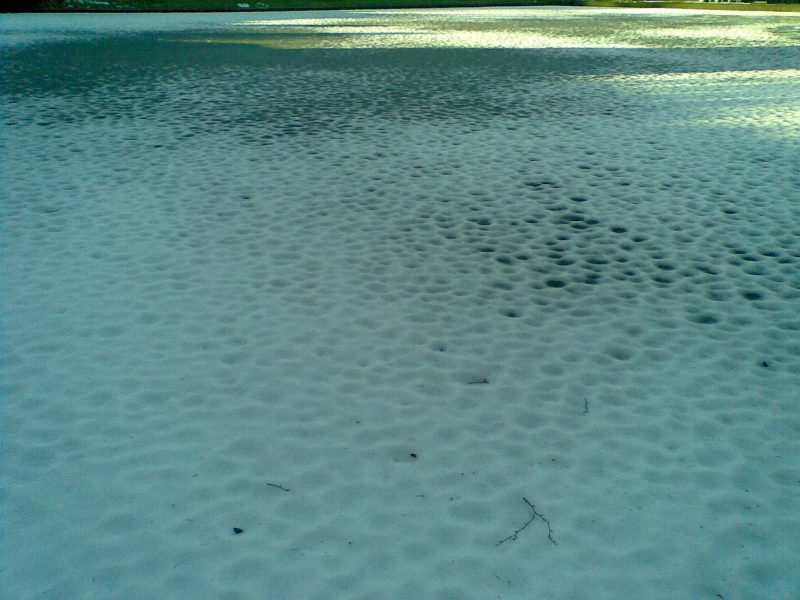 The problem with snow cover is that it fluctuates, it is permeable, allowing moisture through to the turf which can subsequently freeze on the surface and it sometimes disappears after rain. We often disregard this type of research here due to the less severe nature of our winters and the fluctuation between cold and mild spells, which has traditionally made us think that this type of green protection is overkill for the UK. However, in these Canadian studies the same fluctuations were apparent; the snow cover wasn’t constant throughout the winter and in fact was completely melted in December by heavy rains. The one aspect of these studies that can’t be ignored is that the difference in soil temperature between covered and uncovered plots was as much as 100C. Covered plots maintained an adequate soil temperature regardless of snow cover, whilst the uncovered plots saw soil temperatures plummeting to -50C. This is the critical factor when it comes to getting the green back into play early in the spring. These trials also concluded that the critical temperature resulting in plant crown damage (irreversible) was -100C, so anything that can be done to protect the plant crowns would be beneficial. You can get a copy of the full research report by clicking the link at the end of this article. When you do that you will see that the research was specifically carried out on what the Canadians call Annual Bluegrass predominated greens; this is why I think this particular research is very useful to us here in the UK; the botanical name is Poa annua, in other words our old friend Annual Meadow Grass, the predominant grass in most UK bowling greens. The findings are just as relevant to bent and fescue turf. The usual advice applies regarding winter green management; if the weather isn’t expected to be severe then this work could be counter productive and might encourage problems with fungal disease. High Potassium fertiliser applied to encourage hardening off of plants for winter. Preventative Fungicide treatment immediately prior to covering the green. Use a permeable cover on the green surface to keep the green surface protected from the insulating material. Cover the entire surface with a thick layer of good quality clean straw, the thicker the layer the better. Straw is cheap and plentiful and performed very well in the trials detailed above. Cover the straw with an impermeable cover to stop contamination of straw and ingress of water to the green which could freeze at the surface. Is it too late to employ this system now? In most cases the answer to this will be yes. However, if we were to return to mild weather and it looked like there would then be further prolonged freezing temperatures then it could be beneficial to cover the green prior to the onset of the next cold spell. Don’t cover the green too early as this could encourage a major disease outbreak. It is vital to leave the covering process until the last minute before the freezing temperatures kick in. In most of the UK, this will have to be an active management tool; in other words there might be mild spells within the winter period when it would be detrimental to leave the green covered. During prolonged mild spells it will be more beneficial to uncover the green (keeping frost covers handy) and continue with the winter maintenance program, particularly deep slit tining. It will be vital in all cases of green protection covering to apply a preventative fungicide prior to covering. The results from these trials were very encouraging with greens being in very good, playable condition by opening day in April. Maintaining soil temperature and minimising cold damage to plant crowns are the two most critical issues to ensure quick recovery in the spring. The alternative as experienced here in 2010 might be that we have to put up with sub-standard surfaces well into the spring or even early summer period. It must be noted well that this is just another tool in the greenkeeper’s armoury. Nothing in greenkeeping works in isolation and it will be critical to continue to follow a performance greenkeeping program as detailed in Performance Greens, a practical guide. As always I welcome your valuable input, please feel free to comment below.